The Washington Monument towers over the nation’s capital, jutting more than 500 feet into the sky. Its sleek and steely structure represents the resolute character of America’s first president, whose unwavering leadership was crucial to the country’s founding. Over 100 miles away, in Charlottesville, Virginia, a statue of George Washington’s great-grandson-in-law — Confederate General Robert E. Lee — sits in a public park, also memorializing a resolute army commander. Last weekend’s violence-plagued white nationalist march to protest the planned removal of the Lee statue has sparked a renewed national debate over Confederate monuments. And it’s also been joined by dire warnings, from no less than the president of the United States, about the potential erasure of iconic memorials to the country’s Founding Fathers. President Donald Trump has decried calls to remove the “beautiful” Lee statue, and others honoring the Confederacy, claiming that the nation’s “history and culture is being ripped apart” and asking where it might end. "This week it’s Robert E. Lee. I noticed that Stonewall Jackson is coming down. I wonder, is George Washington next week and is it Thomas Jefferson the week after? You really do have to ask yourself: 'Where does it stop?'" Trump asked at a Tuesday press conference. America’s struggle with the original sin of slavery sits at the root of Trump’s query. On one hand are the country’s original authors like Washington, a wealthy slave owner who led the war for independence, helped craft a new government and served as its first chief executive. On the other are historical figures like Lee, a renowned general who rebelled against the Union in a cause to preserve slavery. Resistance to Confederate statues is a more recent phenomenon and has gained momentum in the last 15 years, said Aaron Astor, a history professor at Maryville College in Tennessee who focuses on the Civil War era. A groundswell of opposition to statues of the Founding Fathers, however, hasn't caught on. Is the president right about the impending threat to the founders? Historians who spoke to NBC News said such fears are slightly misplaced and that Trump is championing a murky interpretation of history. “There is a connection of white supremacy and slavery with both men,” said Erica Armstrong Dunbar, a history professor at Rutgers University, referring to Washington and Lee. “Before the Civil War, the entire American leadership owned slaves or defended slavery,” said Astor. But, after that, the comparisons begin to break down. “The president can raise the slippery slope, but it’s a false slippery slope,” said Kevin Levin, a Boston-based historian who specializes in American Civil War history. All three agreed that the main distinction is how men like Washington served their country compared to men like Lee. It’s a trickier exercise, the historians said, to gain momentum to remove statues of U.S. presidents who owned slaves, for instance. 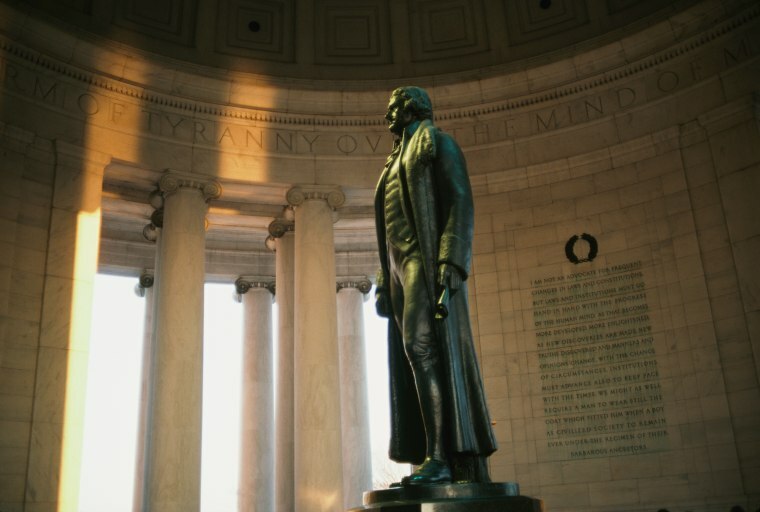 Men such as Washington and Thomas Jefferson, among other founders, embedded the American ideals of equality and justice, even if they did not live them in their daily lives, the historians said. Lee and Stonewall Jackson, however, fought against those very ideals. The statues, plaques and monuments of Confederate leaders are celebrating men who rebelled against their country to uphold a slaveholding Republic and an overt racial hierarchy. Many of the Confederate monuments throughout the south and sprinkled across the north were erected in the 20th Century in the early days of the Jim Crow era, when Ku Klux Klan membership grew. They were primarily promoting racial intimidation and white supremacist ideologies more than memorializing Civil War figures — in essence how white southerners wanted to remember their war, Levin said. But, celebrating a slave owner like Washington — despite his accomplishments — also raises questions. However, the historians said there’s no doubt Charlottesville is a flashpoint for the nation to aggressively examine the issue of removal. City officials across the country have ramped up efforts to remove symbols of the Confederacy, which many say represent racist ideas. The events following Charlottesville, where 19 were injured and one died, have buoyed Take Em Down NOLA, a grassroots organization based in New Orleans. The group was founded after white supremacist Dylann Roof gunned down nine black parishioners in Charleston, South Carolina, and movements sprung up to remove the Confederate flag from the statehouse grounds. The group has pressed New Orleans officials to not only remove statues and names of Confederate figures around the city, but also U.S. presidents who were slave owners. Malcolm Suber, one of the group’s founders, told NBC News that the dedication of these statues is a slap in the face to a majority African-American city. New Orleans removed four prominent Confederate monuments this year and helped prompt a national debate, but the city remains in limbo over removing more. Mayor Mitch Landrieu's office previously told NBC News that officials are still soliciting queries. His office did not respond to a request for comment for this story.